(Phys.org) —It's been a big year for the University of Alberta's Phil Currie, even by his standards as one of the world's top dinosaur hunters. He's lead instructor on Dino 101. This summer, he had a museum named after him. Just last month, his discovery of a pristine baby dinosaur fossil made headlines worldwide. And now, he has helped a Canadian colleague identify a new type of "raptor" dinosaur that lived at the same time as the mega-predator Tyrannosaurus rex and the plant-eater Triceratops. The newly discovered dino, dubbed Acheroraptor temertyorum, was a two-legged meat-eater and close cousin of the Velociraptor. "We have had scanty evidence for more than a century that raptors lived with Tyrannosaurus rex until the end of the Cretaceous," said Currie. That changed with the discovery of jawbones in the Hell Creek formation in Montana—the missing puzzle pieces that helped the Royal Ontario Museum's David Evans, with Currie's help, to place Acheroraptor in the dinosaur family tree. As it turned out, the U of A's Laboratory for Vertebrate Paleontology already had plenty of distinctively ridged teeth from the newly discovered raptor. "You'd be amazed at how difficult it can be to assign a species to some of the specimens we've found—including the thousands of teeth we have in our collection—that don't really tell a story unless we can also identify the animals they come from," explained Clive Coy, senior technician on Currie's team and one of Currie's closest colleagues for the past 33 years. "The paleontology community is very close; we all collaborate to piece together the clues we unearth." Acheroraptor lived 67 million to 66 million years ago in western North America, making it the youngest known member of the raptor family, known as dromaeosaurids. It was about three metres long, weighed in at about 40 kilograms—relatively large for a raptor—and was likely covered in feathers. Looking at Acheroraptor's teeth along with a larger sample of teeth from small meat-eating dinosaurs, the researchers say the evidence suggests a decline in raptor diversity in North America just before the end of the Cretaceous. 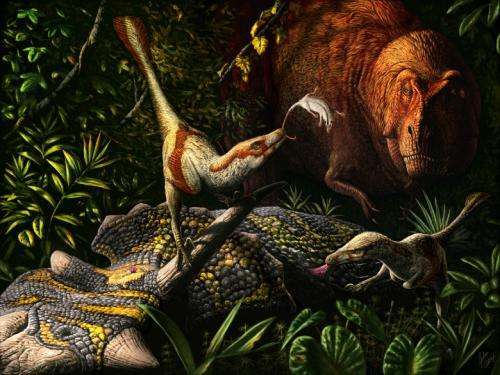 "Acheroraptor gives us a more complete picture of the ecosystem in North America just before the great extinction that marked the end of the Age of Dinosaurs," said Evans, curator of vertebrate paleontology at the Royal Ontario Museum. "The close evolutionary relationship of Acheroraptor to a small group of late-occurring Asian species that includes Velociraptor suggests migration from Asia continued to shape North American dinosaur communities right up until the end of the Cretaceous period." Acheroraptor was described by a team of paleontologists including Evans, Currie and Derek Larson, a graduate student at the University of Toronto who studies under Evans, and a former student of Currie's at the U of A. The discovery was published in the journal Naturwissenschaften.